Jenna Bury lost 40 pounds and 3 -4 sizes since joining BcT! Jenna Bury is 16 (almost 17) years old and is a junior at Broken Arrow High School and Tulsa Tech. She has been a part of Bootcamp Tulsa since she was 8 years old coming with her mother Kerri Bury, but in the last 6 months has really committed herself to changing. That is when she decided to become a BcT member herself. "If you want to WIN more in life you are in the right place my friend! I am blessed and privileged everyday to help people WIN more in life. I got my start as the youngest Director of Strength & Conditioning at the Division I level at Oral Roberts University and have been blessed to COACH professional athletes from the NFL, NBA, MLB, MLS, and WNBA through Dynamic Sports Development. As an ENTREPRENEUR I then started Bootcamp Tulsa to help women WIN in their Fitness, Nutrition & in Life. On a daily basis I now run our Non-Profit, 501 (c) (3), Fit First Responders serving those that serve us everyday, our Police Officers, Firefighters, Medics and national Guard. If I'm not helping people WIN through my Performance Coaching you will find me motivating people on stage through my MOTIVATIONAL SPEAKING in churches, companies, universities and athletic organizations. I even took some of that motivation and combined it with a winning game plan to author a few books. I love helping people WIN but there is nothing I'm more passionate about then being a FATHER to my beautiful daughter and a HUSBAND to my hot wife." GET YOUR FREE WIN ALL DAY E-Book! 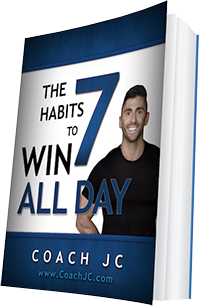 Get Your Free Copy of Coach JC's "The 7 Habits To WIN ALL DAY" book. “RISE UP” collides with “WIN ALL DAY”! Jennie Teeter cane to FFR hurting physically, emotionally and mentally! Suzanne Hardgrove had lost her motivation before FFR! Stewart Andrew was unreliable and unhappy before becoming to FFR! Michael McClendon was just existing in life before coming to FFR! COMMIT NOW…FIGURE IT OUT LATER! Lori Visser found out at FFR that life is not over at age 50! Ken Campbell says FFR not only saved his life but improved it! Darin Detherow took control of his life at FFR! T J Harris changed the way he thinks, he looks, and how he feels at FFR! Channel Six features Fit First Responders and Coach JC! Nathan Boone found renewed energy and a better version him at FFR! The WIN ALL DAY Cookbook!!! Michael Elliot came to FFR 50 – 60 pounds overweight! With Great Risk Comes Great Reward! Jeannette Elliott Is Positive on Purpose at BcT! Jeremy Jackson is a better firefighter after FFR! Tim Sheperd reached his best shape in years at FFR! Tammy Houghton (Ms Purse-a-nality) found a gold mine at BcT! Quishawn Simmons gets in shape for Women’s Tackle Football at BcT! Make Your Faith Bigger than the Giant! Mel Howell loves her “tribe” and the friendships made at BcT! Jeremy Knoland found FFR gave him the time focus on himself! BcT gives Kim Owens energy! Denise Henry was going through life at 190 pounds on a 5’2″ frame before FFR! Theresa Gordon starts her day off right at 5:00 AM WITH BCT! Darren Addudel hit rock bottom before coming to FFR! Julie Durham knew she was in the right place after her first BcT workout! Andrew was not proud of who he had become before coming to FFR! Allison Carr found BcT to encompass all the things she believes in! Amanda Dunn’s first FFR t-shirt was XL…her recent purchase…Small!! Life is What You Make It! Michelle Everett loves the encouragement and accountability at BcT! Christina Griffith found good Christian people at BcT to lift her up! Who is in your life? Sarah Delacerda loves that she now loves to work out! Jennifer Hall likes the variety and whole body approach at BcT! Michelle Williams has worked throughout two pregnancies at BcT! Mandy Haggard likes the push to better herself! If you’re in the Game it is Never Over! Deanna McKnight loves that BcT is more than just fitness! Shellye Johnson loses 26 pounds at BcT! Traci Yates thought running was enough until she came to BcT! Betty McConkey was able to quit smoking when she began BcT! Betty McConkey feels better and healthier since coming to BcT! Gina Taylor went from a size 18 to a size 7 at BcT! Kylie Thornberg built her faith, confidence, strength and endurance at BcT! Tammy Stead says they do it right at BcT and you don’t get hurt! Nick Coffman found a man in himself at FFR that he did not even know! Deedra Determan found BcT changed her life! Jamie Calkins has been blessed by the accountability, encouragement and spiritual aspect of BcT! Pam Alexander feels great, has more energy, and is more positive since coming to BcT! Kristi Main…UPDATE…lost 65 pounds in 2 years at BcT! Lori Whitmore came to BcT to make progress in weight loss after three kids. Galen Howe finds in retirement BcT just brightens her heart! Jill Gwartney came to BcT thirty pounds over weight and unhappy! Joe Alcott was an FFR finalist and dropped 10% body fat! Lori Whitmore was overweight and out of shape when she came to BcT! Kimber Newton has lost 16 pounds in 5 months at BcT! Christina got her happiness back at BcT! Shannon Morgans says BcT helps her keep a positive attitude! Jessica lost 30 lbs and 2 pants sizes in her first 8 months at BcT! Dawn Sponsler goes from a size 14 to a size 8! Tulsa’s #1 Fitness and Weight Loss Program is Bootcamp Tulsa! Jan Wilson learned to give 100% in fitness and in life at BcT! Marcus King physical results at FFR blew him away! Kerri Bury lost 7 inches and 17 pounds in her first 7 weeks at BcT! Darren Aduddell is a top finisher in 25 Week Challenge. Deedra Determan thought Bootcamp Tulsa would be easy! Chad Newton achieved unexpected and highly motivating results at Strong Men! Casey couldn’t get back in shape since she got out of high school until she came to BcT! Wesley Anderson love the challenge of FFR! Kim Owens came to BCT after watching a friend slim down and get in shape. Ginger Ward lost 20 pounds, 25 inches in 6 months! Tracy Thompson was sick and tired of being sick and tired! Alison Cox says the motivation and familiar faces keep her coming back to BcT! Shawn Caudle says the competition at FFR is Friendly but Serious! Michelle Bristle had a dark life of depression, anxiety, and grief when she came to BcT! Amanda Dunn found a new outlook of taking care of herself at FFR! Jill Gwartney felt alone, not loved, and not valued before she came to BcT. Kathy Crabtree says coaches at BcT push you and never disappoint! Mike Reed has lost 50 pounds so far! Jeff Whitfield lost 80 pounds and found amazing motivation and support at FFR! Lisa FitzGerald wouldn’t trade her FFR Tribe for anything! Sheena Kernes found support for nutrition, motivation, and accountability at BcT! Lucy McMath found a physical as well as lifestyle change at Strong Women! Melinda Opela lost 22 pounds at BcT! Candee Branz has more energy and feels better at BcT! Olivia Shubert loves the sisterhood and bonds she found at BcT! Lily Close tried out BcT and loved it! Tiffani Wyke found herself at BcT! Dawn Sponsler can wear a small t-shirt for the first time ever! 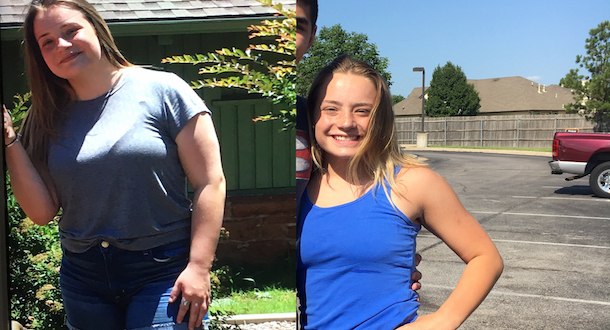 Hannah McKown found results and dietary discipline at BcT/SW! Lacey Hanner completely changed her life at BcT! Elizabeth Ogle finds more energy at 5:15 AM! Michelle Bristle was able to get off depression medications when she joined BcT! Greg Ostrum loses 45 pounds and finds a new lifestyle at FFR! Autumn Toomey gained confidence and love for herself at BcT! Victoria Del Angel learned to control her nutrition at BcT! Boot campers share their amazing results! These “Over 60” ladies rock Jenks Bootcamp Tulsa!! Michelle Bristle’s life was pretty dark with depression and anxiety before BcT! Crystal Morgan goes from 14 to size 10 jeans in just 3 months! Lexie Beyer former college basketball player fell in love with BcT! Heather Knotts came to BcT suffering emotionally and withdrawing! TJ Harris wants to get bigger, stronger faster! Rebecca Hunter turned her downward spiral upward at BcT! Jennie Teeter is now confident and likes the person in the mirror…inside and out! Terry Sivadon knew in his heart that FFR was the program for him! Melinda Williams goes from Size 8 to size 6 first 2 months at BcT! Detective Lori Visser loses 26 1/2 inches in 25 weeks! Christina Griffith has a Fire and Passion for Strength! Sarah Kepple takes time for herself at Bootcamp Tulsa! Marnie Waller loves that her fellow responders are FAMILY at FFR! Annie Bilby is blessed by her BcT friends! Cassie Summers loves the physical AND the mental gains at BcT! Amanda Caperton lost 16 pounds and went from size 10 to size 4 her first year at BcT! Jennifer May shares why she added Strong Women to her BcT workouts! Jenny Hudspeth came to Bct overweight, out of shape, and approaching 40! Michelle Lowry’s true gift from BcT is the family she inherited! Lydia Thomas was in pain every day and needed strength so came to Bootcamp Tulsa!! Emma Meyer says BcT makes her a better her! Anne McCord loves her ‘bootcamp’ body versus her ‘running’ body. Jennifer May was hooked on BcT by the end of the first class! Emily Rhoads lost 14 pounds and 10 inches in 7 months! Vanessa Clark loves being sore every day! Amanda Shook sets goals and demolishes them at Strong Women! Jackie Cummingham says BcT has given her a healthier life! Cathy Freeman loses 20 pounds and 6 – 8 inches at BcT! Becky Bilby was excited to get her Golden Kettle Bell! Denise Henry says FFR is her home and her family! Heather Greenwood says FFR is Best Thing Ever!!! Rebecca Hunter’s life was on a downward spiral until she found BcT! Erin Harris says BcT and Strong Women are the perfect combination for her! STRONG WOMEN led Jessica Mathias to do things she never knew she could! Christine Reed says Strong Women allowed her to find her strengths and destroy her limitations. Richard Hopper find incredible results at Strong Men! Donna Kashwer lost 40 lbs. in her first 6 months….now 57 pound lost! Adam Bivens was on the road to a heart attack before joining FFR! Stefany Howell has lost 126 pounds!!! Dakota Crase finds so much support in his FFR Family! Tamara Wahl went from SIZE 16 to SIZE 10 at BcT! Carrie Orth was embraced by the sisterhood at BcT! Eileen Lubinski feel better about her self since starting FFR! Stacy Belk says FFR is by far the best workout atmosphere he has ever seen! Kelly Stacy stays at BcT because of Lydia Thomas! Angela Breeckner says her entire family is healthier since she began BcT! Bobby Zigmont is in the best shape of his life at age 41! Chris Kundrock hated working out and now loves the gym! Breanna Brumley is in the best shape of her life! FFR is more than a physical workout for Kyle Zickefoose….it is a mind shaping experience! Chuck French doesn’t want to ever stop coming to FFR! Jennifer Estrada found a great workout, better body, and made a lot of new friends at BcT! Stephanie Brown loves the energy BcT gives her for her day! Katie West was tired, not liking her body, and relying on caffeine before BcT! Candice Alcott for results at BcT in a big way! Erica Leatherbarrow considers her BcT friends family! Rachael Lowe gets her life back at BcT! Hannah Fowler is more alert, disciplined and overall happier since BcT! Becca Hunter lost weight when she took control of her nutrition. Diana Loehrke found Bootcamp Tulsa on her morning jog in Jenks! Micheal Elliott is dedicated to continuing his FFR success! Misty Heard enjoys working out while the world is sleeping! Stefany Howell was 300 pounds and depressed before BcT! Aubrey Jones was hooked on BcT after her month trial! Darin Detherow loses 53 pounds to become a top finisher! Teresa Martin was letting fear control her life before she came to BcT! Tolissa Autry left her comfort zone to find rewards at BcT! Stewart Andrew says FFR is his best decision in a long time! Liz Egan says the changes FFR brought to her life were lifesaving for her! Patrick McLean is creating a healthy spiritual life for his family. Winner Michael McClendon says the internal changes acquired through the Fit First Responders Challenge far outweigh the external changes! Heather and David Weakley just can’t get enough of the positive that comes from FFR/DSD! Anna Cowdry and her daughter found DSD/FFR sparked a relationship with exercise for both! Craig Coats now sees food as fuel and a tool to get him to his goals! Policeman Dave Pyle knows no bad guys train like we do at FFR. Gerald Scott thanks God for Fit First Responders! Earl Blevins’ goal is to compete against himself to get better! Amy Jensen goes from minimum effort to feel good to maximum effort to achieve success! Jarrod Hart healthier lifestyle is leading his family to a healthier lifestyle! Jeremy Jackson says without a doubt FFR has changed his life forever! Stefany Howell came to BcT weighing nearly 300 pounds and on medication for depression! Luke Flanagan feels stronger, lighter, happier and more confident since joining FFR! Darin Detherow loses 42 pounds…quits chewing tobacco after 23 years! Alexander Peiffer results at FFR just get better and better! Teresa Phibbs Rosiere-Martin, single mom of seven children, finds a whole new level of life at BcT! Thomas Bell found 40 could be the beginning of the best years of his life! Aaron McGhee misses FFR on the days he has to work! Darci Carter’s results keep her coming back to BcT! Matt McCord is the healthiest he has ever been in his life! Shearon Bolton find things you thought you could not do…you can do! Stacey Gray has improved her body….but also her mind and soul! Betty McConkey quit smoking….and that’s a big one!! Lily Close is strong and has muscles….and she likes it! Gina Taylor goes from a size 18 to a size 7!! Carmel Jasmin will look fierce in her wedding gown! Kerry Olson lost 30 lbs. last year and wants to keep that going! Carrie Orths belongs at Bootcamp Tulsa, and so do you! Kat Graham joined Bootcamp Tulsa to just get healthy! Natalie Iannazzo won the Bridal Challenge! Kylee Sigcha says give Bootcamp a try! Kelli Stacy gets her day started right at BcT! Stefany Howell’s greatest joy ever is to be an inspiration to others! Amanda Wooten never thought she could look and feel the way she does! Kim Adkison says Bct is really, really early…..but well worth it! Lori Whitmore days just aren’t right with BcT! Lily Close loses 12 pounds…from size 10 to size 6! Michelle Bristle credits BcT for making her a better all-around person! Lisa Thompson overcomes many odds at BcT! Norma Cox — her positive addiction makes her happy each day! Dawn Sponsler found herself sitting on the sidelines while her kids did DSD! Jinger McPeak was unbelievably surprised by Bootcamp Tulsa! Ashley Coffman is a role model for her boys! Deedra Determan calls on Coach JC for Advertising and changes her life! Kelly Stark has muscle and strength that was once a distant dream! Katy West is back in Pre-pregnancy jeans after 6 months at BcT! BcT helps Leslie Lawrence make fitness a priority! Jennifer Estrada finds great workout, better body and friends at BcT! Katie West gets her Self-Confidence back at BcT! Michelle Bristle gets off Medication due to BcT! Jason Combs bonds with his boys through DSD! Lori Whitmore loses 26 pounds in her first 8 months at BcT! Victoria Del Angel says the girls at BcT hold her accountable. Cherie Mann — Bootcamp Tough! Time to Think Even Bigger! Gloria Thomas — Two Awesome Years! Live, Learn, and Move On, Baby! Collegiate Athlete Paige McMurray loves BcT! Gina Taylor — Do it for You! BcT is Corina Parker’s coffee in the morning! The Pumpkin Workout – Help Build a Dream with LOVE! Becca Hunter is ready for the Beast in Dallas!! GET WHAT YOU CAME FOR! Discover 3 Keys to WINNING MORE and to LOSE MORE! Mindy Kincade — Bootcamp Tulsa Lifer! Help Me Name My Whole Foods Smoothie! BIXBY OKLAHOMA BOOTCAMP IS HERE!!! Yummy goodness you must try! Are You SUMMER SHAPE Ready? Sweets? Please I need my sweet fix! BE STRONG AND OF GOOD COURAGE! SMILE and Shut The Heck Up! Holy Moly, Who Loves Guacamole? 5 Ways To Feel Like a Boss and WIN. My Power Smoothie – The Killer Kale! All Access Pass into My Life: You can stop living or choose to WIN! “WHY” are you giving away a MERCEDES? Are you giving up the LOLLIPOP? YOUR 14 Day Meal Plan… Questions Answered! Why Coach JC Blog was Created!